Streamline your trademark practice with a seamless, all-in-one solution. Regardless of where you are in the process—research, search, application, appeal, or foreign registration—you'll find exactly what you need with WK Trademark Navigator – a single solution for a multifaceted process. WK Trademark Navigator is now available on the Cheetah platform, with even more powerful search capabilities, an intuitive interface and content hierarchy, and one-click access to all references and tools. Managing numerous trademark portfolios across multiple jurisdictions is daunting enough, but when you add the complexity of trademark prosecution work to your daily workflow, it is much harder to work efficiently and stay on top of it all. Unfortunately, the information and tools you need to manage your practice effectively in the PTO and before the Trademark Trial and Appeal Board (TTAB) are often found in multiple sources and various media—costing those you represent valuable time and money. A network of IP experts provides clear, cogent analysis of complex legislative, regulatory and judicial issues. 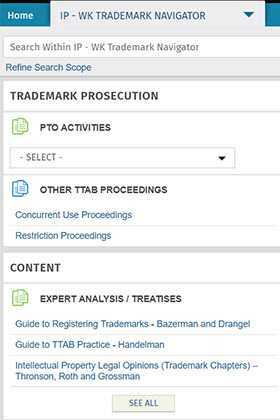 Access to industry standards such as Allen’s Trademark Digest and the Guide to TTAB Practice right on your desktop. Daily news written by lawyers providing timely insights - plus every case study has links to the court opinion for further investigation. SmartCharts provide quick answers and include Likelihood of Confusion by Circuit and TTAB Precedential Decisions. Comparison Charts for both domestic and foreign issues increase research efficiency every step of the way. The news component delivers the latest developments in trademark law so that you are always up to date. Sample forms and documents streamline your workflow so that you can proceed confidently and efficiently in your trademark prosecution work and practice before the TTAB. Checklists help you keep track of every step in the application, cancellation and opposition processes, including appeal.